Take a quick and easy beginner's course in the world's most popular card game. From evaluating the hand to complex bidding tactics, here is everything needed for a sound grounding in bridge. Even beginners will play with confidence when they have these easy-to-follow instructions and diagrams as a guide. Simple explanations of all the rules, plus illustrations of sample hands and scoring, provide the basics. A "get to know bridge" section explains the pack, choosing partners, shuffling, dealing, sorting, tricks and trumps, notations, and much more. Extensive coverage on bidding includes values for games and slams; a variety of openings; the denial pass; a change of suit response; several responses to opponents' bids; defensive and sacrifice bidding; and a huge range of other options. This book starts at the beginning, introducing the mechanics of the game through its history. It covers the fundamentals of the three aspects of the game . . . bidding, play, and defense. 32 prepared deals carefully give you a chance to practice what you've learned. The concepts and information presented are the most current and accurate available, developed with the assistance of the game's top champions. The material is presented in a clear, well-organized format, moving smoothly from one topic to the next. This book covers the concepts needed when both sides are bidding for the contract. It introduces the basic competitive tools--preemptive opening bids, overcalls, and takeout doubles. The concepts and information presented are the most current available, developed with the assistance of the game's top champions. In this fun and easy-to-understand guide, Grand Master Eddie Kantar shares with you his years of bridge expertise, getting you up to speed quickly with the basics and then introducing you to the finer points of tricks, bids, contracts, and strategy. 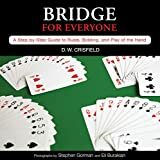 Plus, Bridge For Dummies features a guide to computer bridge games and Web sites devoted to bridge. Numerous helpful illustrations and diagrams guide readers through the process of dealing and organizing a hand, calculating points, making an opening bid, taking a trick, and more.